We present to you a new rating system for everyone who plays tournaments on the TSS portal. The introduction of the rating system will allow players who haven’t played in tournaments to start by facing opponents of the same experience. Meanwhile, players who already play tournaments will get matched against other players at the same level of skill. The rating in the TSS tournaments is based on the well known ELO system. How can you receive your rating? Starting from February 16th, 2019, all players who have registered in any tournament on the TSS portal will receive a starting rating of 1000 points. Players who already played in TSS tournaments will also have receive the same initial rating of 1000 points. Depending on the success in tournament matches, player ratings will change, increase or decrease. Each match that is won or lost in tournaments will affect your personal rating. After the first tournament where a player plays at least one match and receives their first rating points, his or her nickname will appear in the TSS ratings leaderboard. Points in the TSS ratings leaderboard are based on the tournament game mode (Arcade Battles, Realistic Battles or Simulator Battles) and the tournament type (air, ground, naval, combined) that the players participated in. The personal rating of each player is influenced by any tournament available on the TSS portal, regardless of the format (1 vs 1, 2 vs 2, 3 vs 3 and so on). 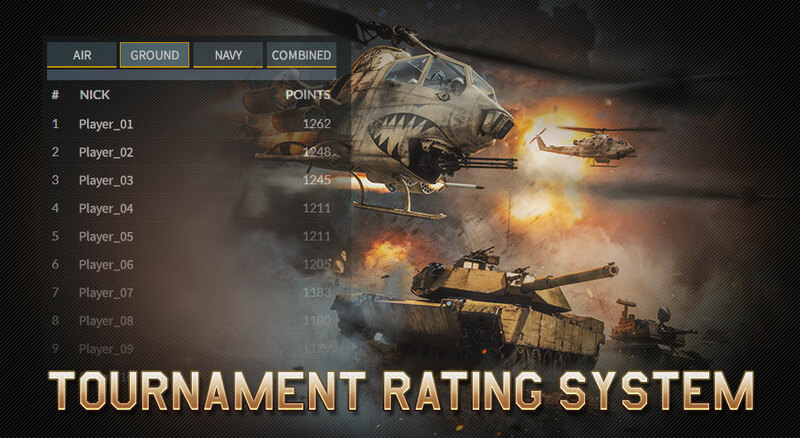 In order to check your rating, you have to login on tss.warthunder.com, then go to the the TSS ratings leaderboard - you will see your place in each of the game modes and types of tournaments. If you haven’t played in some game modes and tournament types, your nickname will not show in that leaderboard. Based on your ratings, you can find a specific tournament type where you would like to improve your rating. After 30 days from the introduction of the ratings system, on March 18th, 2019, the first rating tournaments will be created. In order to register in these tournaments, players will need to have a certain level of rating. Based on your level of rating, you can take part in these tournaments - minimal (for new players), average (for experienced players) and maximum (for the best players). In time, by playing in tournaments, you will be able to increase your personal rating and move in higher levels of rating tournaments. Test your strength using any vehicles or invite your friends and play in a team tournament. Win unique decals, trophies and Golden Eagles in the TSS tournaments! Manfred_Albrech, i sell you my e100 for 1000GJN! you welcome! Revert the penetration changes or fix the formula. Good addition. However, I believe you should split the racing players from the actual combat players. No disrespect to Fins_FinsT as he is truly the best racer. But he has no place in the combat ranking. It is possible that race tournaments will have their own rating in the future. Any details regarding prizes in new system?